With the foldable design, it can be folded up easily and very convenient for you to storage. Carry arms longer than 27.4" can easily hold up to 2 bikes while the large car pads disperse weight and keep your vehicle finish in pristine condition. 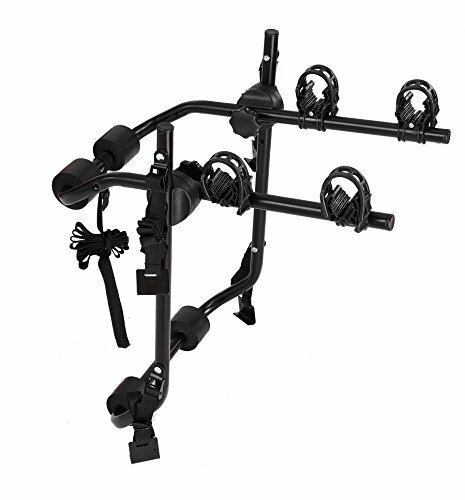 Carry arm with three position adjustable hub spacing designed to accommodate an array of frame styles and sizes, not recommended for step thru frames. If you have a bicycle with anon-conventional frame, such a woman's, child's or full-suspension bike, youneed a frame adaptor to carry your bike on a hanging-style rear mount bike rack. The AMAZON IKURAM shop is the only authorized store and all infringements will be subject to complaints. Well-constructed frames which are made of Heavy Duty steel and gas/oil resistant power coating finish can take up to 128 LBS. Individual Dual-Compound tie-down cradles with super flexible straps take great care in securing your bicycle while protecting them from damage. It features six straps that secures the rack to your vehicle and easy to adjust. With the intergrated tie-down straps, it gives extra stability and security when in use. Easy to use snap-strap setup system allows for quick and easy installation without any tools. DIY instruction is included in package. 100% assembled. Specially designed to fit most vehicle types including sedans,hatchbacks,minivans and SUV's. (Not recommend for vehicles equipped with rear spoilers. If you have any questions about this product by IKURAM, contact us by completing and submitting the form below. If you are looking for a specif part number, please include it with your message.